Salvia spathacea (picture right), in the United States this one is called ‘Pitcher Sage’ or ‘Hummingbird sage’ a reference to the shape of its flowers and its bird attracting characteristics, in Australia we have also seen it referred to as ‘fragrant sage’ and indeed both its flowers and foliage are fragrant. The foliage does have a distinct citrus perfume and the flowers are a little different to most other species. This is a low growing species, sometimes slow to establish, however once it is settled in it will spread by underground runners to form a large clump. Not a species for humid climates, however it is both frost and drought tolerant once established. Like most salvias this one is drought tolerant and hardy once established, a fairly low growing evergreen salvia (to around 50cm) with attractive flowers with a lighter green foliage. We have found it to be early flowering. Salvia spathacea is a species from California and is well suited to our Mediterranean climate. Botanical Name – Salvia spathacea. 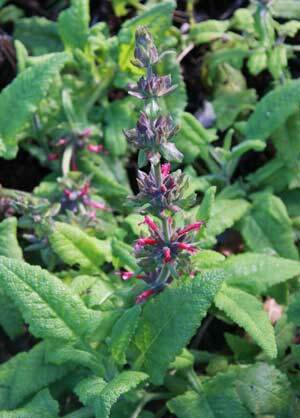 Common Names – Fragrant Sage, Hummingbird sage. Height – Will reach form .5 metre to 1 metre, variable. Spread – To .5 metre. Drought tolerance – Good once established. Frost tolerance – Mild frosts only. Foliage – Mid green and aromatic. Flowering period – Through spring and summer until autumn.